Do you need to organize site menus several levels deep, with a large number of menu items? WordPress Menu Management is fantastic for most sites, but needs a little help if you plan to build out huge menu systems. The Visual Site Manager plugin is a good supplement to the core menu system in these cases. A huge menu with several levels can be difficult to visualize and manage. The core WordPress Menu Manager is built for the majority of sites, typically building menus 2 to 3 levels deep. If you must build out larger menus, a better visualization tool can help. 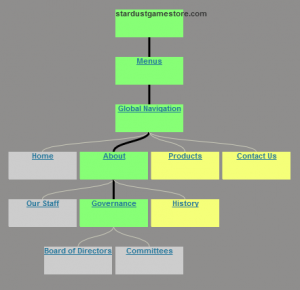 Visual Site Manager shows your menus in a sitemap-style tree view. You can drill down through menu levels, and even add new child items–right from the tree. In the “Tree View,” any item containing children appears with a yellow box. Clicking the yellow box turns it green to show it’s part of your currently chosen path. Then, child menu items at the next level appear below. Clicking the title of any menu item gives you a details box, where you can change the item’s label, edit or preview the item it links to, and add a new child menu item. New child menu items can be Pages, Custom Links, or Posts. The main view I found most useful–shown as the first screenshot in this article– is called “Map View.” This view shows the menu item tree vertically, with the root at the top, opening downward as you dig further. An “Outline View” shows essentially the same thing, but starts building the tree from the left and moves right as you go further. This view seemed more crowded and less helpful to me. A “List View” is available for Menus and Pages. These views seem to duplicate functionality already existing in core menu and page lists, but in a non-standard way. I scratched my head for a while and tried to figure out when this view would be most helpful, but couldn’t think of any use cases. I’d like to see drag-and-drop arrangement of menu items in the tree view. On a site with a huge menu system, such drag and drop in the core menu manager is cumbersome–I call it a “targeting issue.” As I said before, the core menu manager just wasn’t built for large menus. Drag-and-drop menu item arrangement would be a major boost to Visual Site Manager and the users it’s most suited for. I noticed sometimes when choosing a new menu item to see its children, the previously chosen menu item did not reset its color from green (active) back to yellow. This broke the nice green “path” indicating where I was at in the tree and how I got there. It’s not really a big deal–the tree makes it easy to see where you are without any use of color. I’d either fix this color reset issue or remove the color coding altogether. Do you work with sites having large and deep menu trees? Do you use tools other than the core menu manager to keep it together? Let me know what you’re using and the challenges such menus still pose. Surprised girl face photo: Pecia!